“Where’s Grandpa?” from Christian Faith Publishing author Dr. Renée A. LaCour is a heartwarming children’s story that follows little Maria, a five-year-old girl who one day asks her visiting grandma a nagging question that will not leave her alone for the whole day to follow: Where is Grandpa?—it is a question that will not rest without an answer, and the next day, Dad lovingly and wisely takes Maria on a drive to the memorial grounds to satisfy her curiosity. “Where’s Grandpa?”: a charming story of a young girl learning about her family. “Where’s Grandpa?” is the creation of published author Dr. Renée A. LaCour, an accomplished, multitalented ordained minister and “super senior” who—on top of several published titles along with her notable work in ministry, on stage, radio, film, print, and television—is also a mother, grandmother, and great-grandmother currently living in Chicago. Dr. LaCour writes about the moment the pivotal question first occurs to little Maria: “It began on a chilly Saturday afternoon of December 3, 2016. Grandma had just been dropped off at her granddaughter Maria’s house by Eric, Maria’s dad. He had dropped his mother off so he could run a few errands before coming back to pick up his wife, Annie, Maria, and Grandma to go to see the movie, ‘Almost Christmas’. Published by Christian Faith Publishing, Dr. Renée A. LaCour’s new book is a poignant story of a young one’s touching curiosity, her charming innocence and persistence, and her idealistic love even for relatives she has never known. In these wonderfully illustrated pages, Dr. LaCour encourages in children a sense of family and loyalty—and perhaps inspires a few questions of their own. View a synopsis of “Where’s Grandpa?” on YouTube. 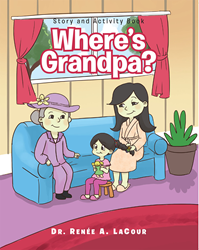 Consumers can purchase “Where’s Grandpa?” at traditional brick & mortar bookstores, or online at Amazon.com, Apple iTunes store, or Barnes and Noble. For additional information or inquiries about “Where’s Grandpa?”, contact the Christian Faith Publishing media department at 866-554-0919.